squinting from the past – . A squint seems like a funny name for a window. Apart from describing a medical condition, we use it now, mostly to suggest someone looking with their eyes partly shut, often against the sun; it’s a very common Australian characteristic. When I don’t have my glasses to read, I instinctively squint, and for some reason, the words come more clearly into focus. And that partial vision is exactly what a medieval squint was intended for, especially for those enclosed in an anchorhold. Cut into the church wall which adjoined the anchorhold, it gave the anchoress (or anchorite) a limited view of the altar and little more. It was considered important for the holy woman to be able to see the moment of consecration, the bread and wine lifted up, but there was to be nothing else that might distract her from God. I imagine the anchoress kneeling at her squint and wondering about the people in church, hearing the whispers, the coughs, the shuffling feet, perhaps even the conversations. She would hear and smell — probably even more acutely because she could not see — so much that was happening. After a time, surely she would get to know the voices, imagine the faces that accompanied them, just as we think of the faces that accompany radio presenters. That tantalising, partial view says so much: this far you may look and no more; this narrow view is all that is permitted. It is almost more powerful a signal of the dangers of sight than if the anchoress were given no view at all. This is the view from the squint at Chester-le-Street, near Durham. The cell had two storeys, so the eye looks out high over the pews, but the view is severely limited. Because the stone wall is so thick, and the squint cut on about a 45 degree angle, it is impossible to see anything more than this. I tried when I took this photo! 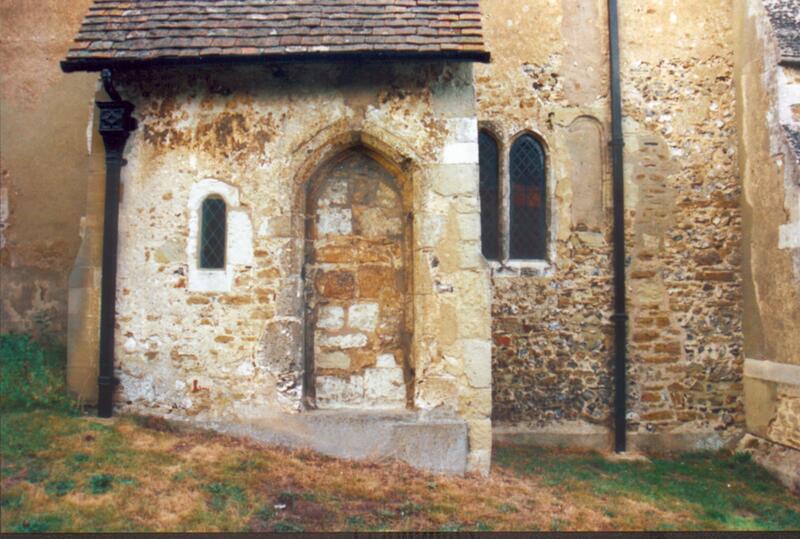 Another squint, of the same design, at St James, Shere, shows the design more clearly. 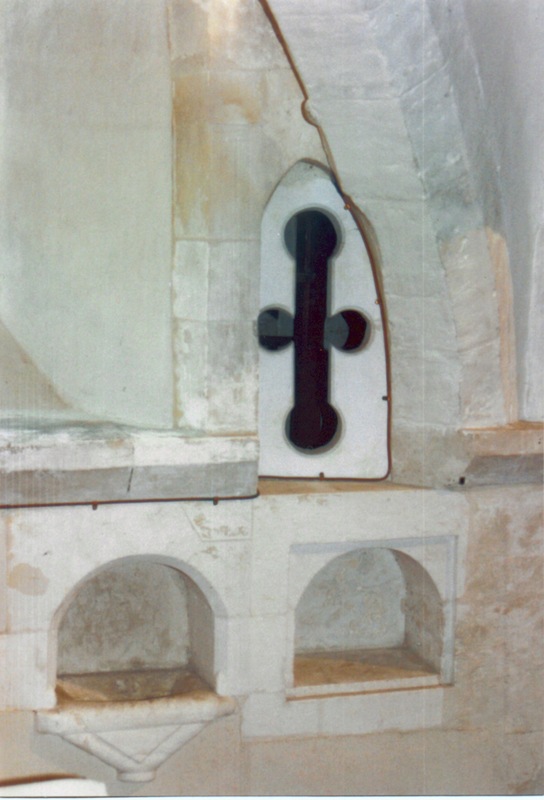 The quatrefoil on the left would allow enough space for the anchoress to receive the bread at Mass. But even though squints were designed to limit sight for the recluse, they were usually close to the chancel at the front of the church, and some were designed to participate in the beauty of church decoration. St Nicholas at Compton predates the Norman Conquest in 1066, and later building shows distinctive Norman designs. A squint and cell are still in existence . 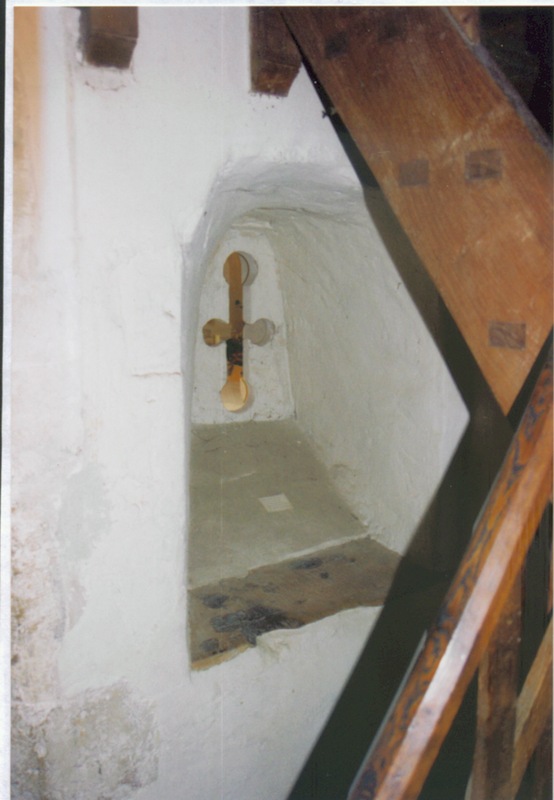 The tiny cell and its squint have remained, in part because the cell now houses a staircase to the chancel loft. The squint is austere but, in some ways, quite beautiful. The photo on the left shows the squint from inside the cell, with part of the contemporary staircase. The wooden ledge, on which the recluse would have leaned to pray, is thought to be original. The photo on the right shows the squint from inside the church. Whatever we think of the extreme enclosure an anchoress accepted, it’s worth considering the ways that narrowing down a view can help us focus more clearly. As William Blake suggests, we can ‘see a world in a grain of sand’. And by seeing the small and perhaps uncomfortable aspects of the past, we might discover more about ourselves. Definitely food for thought . Beautiful evocative photos too. Thanks for dropping by, Val. It’s an intriguing idea, isn’t it?